I’m still in Arizona on a girls trip with my mom, sisters and aunts. We are having the time of our lives and have eaten way too much junk – so much for starting the new year off eating healthier. We all pretty much through that out the window this past weekend. So staying true to our weekend of eating, I’m sharing this yummy cake today. This cake has got to be one of our all-time favorites. You have probably all had it before. It’s not rocket science to make and there are recipes floating all over the internet/pinterest, but just in case there is someone out there who isn’t lucky enough to have ever had this cake, I am sharing it today. I’ve heard it called many different names but our favorite name for it is “better than seminary cake.” We were feeding the missionaries one night awhile back and I had made this cake and one of the Elders called it that. That name has just stuck and now my boys call it better than seminary cake. There are so many good things about it . 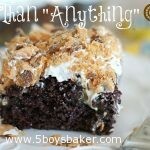 . . Chocolate cake drenched in caramel sauce, sweetened condensed milk, and Butterfinger. Does it get any better than that? Let cake cool for about 10-15 minutes. Slowly pour over sweetened condensed milk over the top making sure to get some in all the holes. Next drizzle the caramel topping evenly over the cake slowly, making sure to get some in all the holes. Sprinkle with crushed Butterfinger candy bar pieces.